​Vocabulary activity as a fast formative assessment. Word ping-pong is a quick, fun and entertaining vocabulary assessment activity that could be used with the class or a group of students as pre-assessment or a reflection at the end of the class as well as the unit. With this vocabulary activity you can either check students previous knowledge to build the class on or it can also be a feedback for teachers or reflection for students at the end of the class to see how much students remember or if they need more practice on. Word ping-pong is all in one: an entertaining activity to practice, revise, assess students vocabulary in a fun way. It could also be used in an ESL classroom. How I found this activity? I constantly search for something different to start the class with or assess how much vocabulary they remember of the unit or actually you just want to have a bit of fun with the kids? Most of us have days when something new, something different, a five minutes activity would change the whole day. Whenever I feel like changing the path of the day or lesson a little bit, adding an activity, a game, make children compete or only want to spice up the class, I come up with a short activity like Word ping-pong. In this case, as a fast assessment, I get them play Word ping-pong. Word ping-pong is a no prepare game that you can use as a warmer at the beginning of the lesson, a gap-filler when your students need a break because they worked hard on something important. You can also use it as a cooler if you have five minutes left at the end of the class and there is no point starting anything new with them. It can also be used as an assessment at the end of the class to see how much students remember about the new content taught that day. As you don’t need to prepare, only explain students how to play, you can choose to play it any time. Arrange students into pairs. I usually do it by pot luck. Line them up and start counting: one, two, three, four, five, six, one, two, three, four, five, six, etc… If you have more students. Same numbers make pairs. When everybody has found their other part they sit down together with the piece of paper and pens. Students need to write as many words as they can think of (only one word at a time), related to a given category such as animals, food, adjectives etc. depending on what you want to revise, practice, reinforce with them in a short given time (between 1 and 3 minutes). 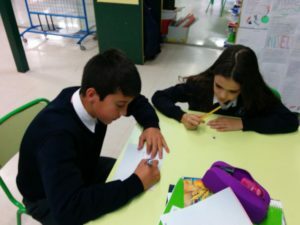 The name of the game is Word ping –pong and the reason behind it is that instead of a ball, a piece of paper goes back and forward between students as soon as they have written their word. Make the rules clear, they can only write one word at a time and pass the paper on to their partners, they can’t talk or help the others what to write only wait for their turns quietly. I usually make the pairs use different colours of pen or pencil so it can be easily checked if they write more than one word without passing the paper to the other. Tick-tack, tick-tack the countdown begins. When the clock sounds or you say stop, they have to put the pens down and count their written collection of words. Whichever pair has the most words, wins the game. If you play it with older students check correct spelling as well. Whatever they are not confident with or you want to make sure they know how to spell it, put them up on the board. So they can visualize and correct their mistakes. If you have younger students you are probably interested in their vocabulary of the topic and not how they can spell so make that clear for them at the beginning to avoid complains at the end of the game. Set the timer for 1, 2 or 3 minutes, believe me it’s going to be enough. Tell the class the category and ready, steady, go. Watch them thinking and writing eagerly. We played it with different age groups from 7-12 years old students. All loved it. Try it, have fun and leave a comment below how it worked in your class.